JAKARTA, 23rd November 2017 – The Indonesian smartphone market recorded 7.2 million smartphones shipped in 2017Q3, declining 8.6% quarter over quarter (QoQ) and 1.1% year over year (YoY) after the festive Lebaran period in 2017Q2. Smartphone average selling prices (ASPs), on the other hand, rose to US$193, a steep increase of 9% QoQ and 31% YoY, as many popular smartphone models from Samsung and OPPO were at higher price points than before. “Apart from the seasonal retail activity slowdown after the festive Lebaran period in 2017Q2, some smartphone companies took the opportunity to clear their inventories from that quarter to make way for an array of new models to be launched in 2017Q4, when retail activity is expected to pick up again," says Risky Febrian, Associate Market Analyst, IDC Indonesia. 3 of the top 5 smartphone players are now China-based brands . 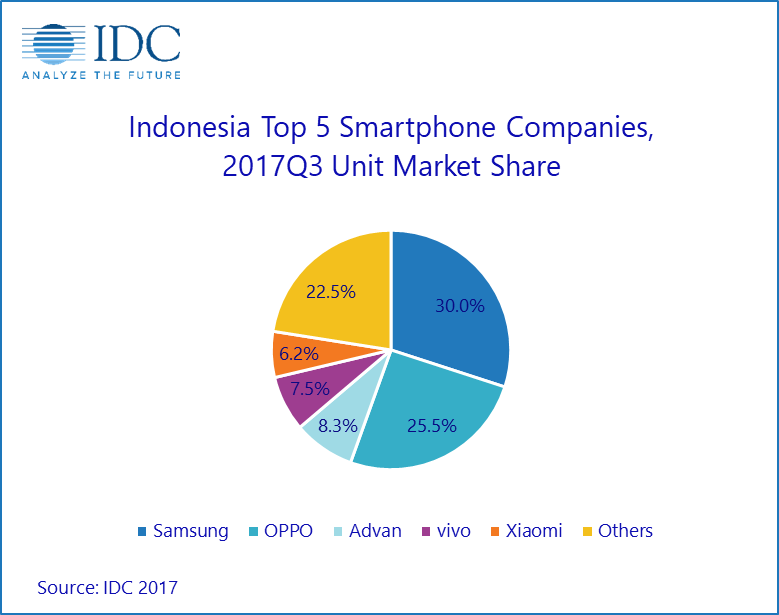 Despite the overall decline in shipments, vivo and Xiaomi were the most notable Chinese vendors in the Indonesian smartphone market as they gained market share. vivo continued with its aggressive marketing activities — similar to OPPO. Xiaomi has also joined the competition, increasing its offline retail presence and advertisements in densely populated areas. Top local brand Advan attempted to differentiate itself by boosting marketing for its IdOS ecosystem, introducing security features such as “Xlocker” and “Privacy Protector” as its unique differentiators. End users’ preferred price points remain in low-end (IDR1.4mn<IDR2.7mn / US$100<US$200) while midrange (IDR2.7mn<IDR5.4mn / US$200<US$400) continued to gain traction. Indonesia remains a budget-conscious market, with low-end smartphones still dominating half of the market with 47% share, while midrange smartphones continued to grow with 32% share in 2017Q3. Despite OPPO and vivo’s marketing activities for their midrange devices, it was their low-end models (A and Y Series, respectively) that drove up their shipments. Xiaomi played in the same space, the Redmi series being its volume driver. Dual camera and thin/bezel-less screen features to drive midrange segment growth. More smartphone companies are expected to follow the trend, targeting replacement users with these features on top of competitive spec-to-price ratio. These features, which used to be found exclusively on high-end devices such as the Galaxy S8, will eventually become more mainstream as Chinese and local vendors adopt these features in their phones to stay competitive. “In the coming quarters, as competition continues to intensify, smartphone companies will leverage on various means in their marketing campaigns. From a marketing standpoint, they will leverage on the mobile gaming trend by associating themselves with mobile games that are fast becoming popular especially among youths. They will also adopt the latest features such as facial recognition biometrics and on-device AI (artificial intelligence) to stay technologically relevant,” ends Febrian.